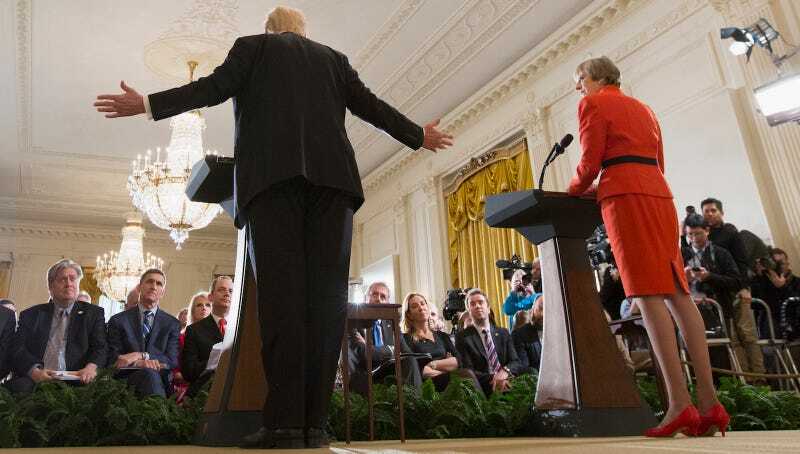 At a joint press conference with British Prime Minister Theresa May—whose name was spelled wrong three times by the White House ahead of her sit-down meeting with Trump—our president emphasized the importance of the U.K.-U.S. relationship. “This is our first visit. So. Great honor,” he said, as he read an opening statement closely from a piece of paper, appearing to hold a finger on the page. In response to a question about potential shifts in the U.S. relationship with Russia and talk of potentially lifting sanctions, which has sent Sen. John McCain into a fit (though McCain, rather mysteriously, also recently announced that he’ll vote to confirm Rex Tillerson), Trump replied: “As far as the sanctions, it’s too early to be talking about that.” Kellyanne Conway, meanwhile, has been talking about it. Here’s what he said next, and really, who can say what it means?